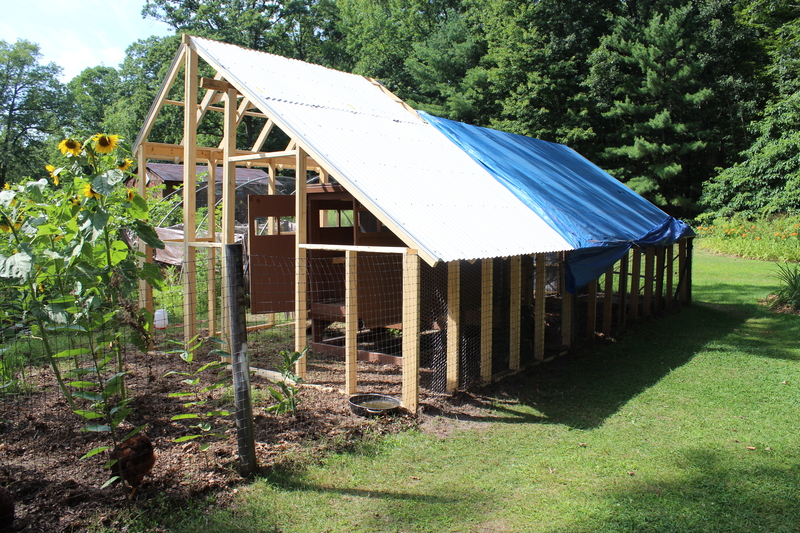 In spite of being in the upper 80’s on the homestead today, the chicken run roof is going up. The two roof lines will meet when the roof is completed. We selected white plastic corrugated roofing panels to match those given to us by a friend used previously on coop number 1. These will also reflect the heat in the winter months and provide more light and warmth in the run during the bitter winter cold that we typically experience here. The run frame as seen from the west. This is tall enough to walk in. We decided to build a covered outdoor run for our birds to enjoy the fresh air. During the nice weather months the feeders and waterers can be placed in the covered runs so the coops stay dry and clean. 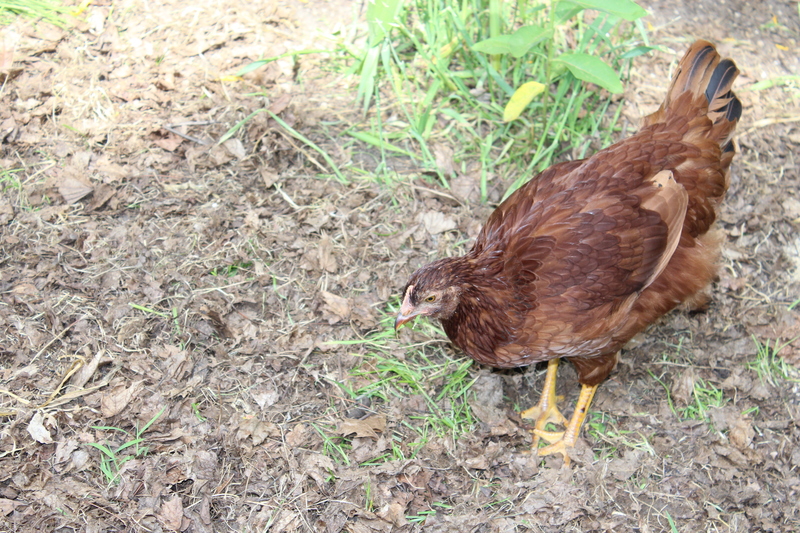 During the cold and snowy months, the birds can get out of their coop and move around without walking in the deep snow, which most chickens do not like to do. 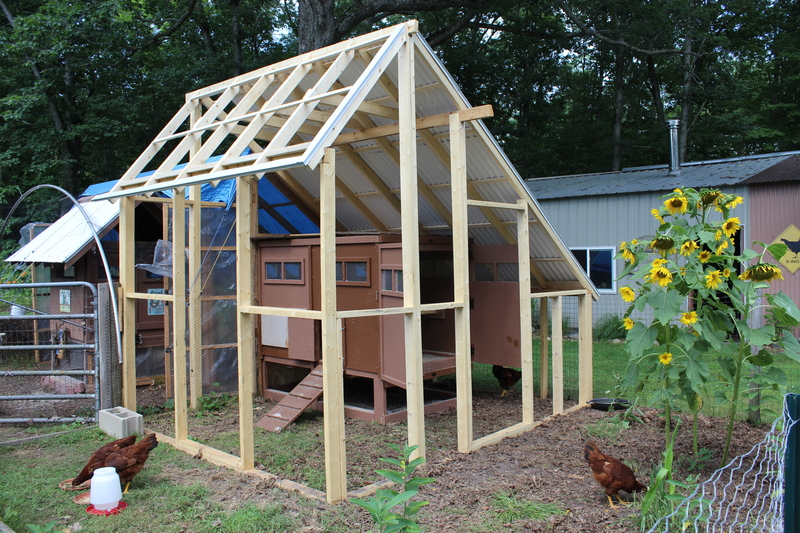 This will eventually have chicken wire with plastic panels over it for winter use. The 4 month old Rhodies scratching around in there outside run area. To provides shelter from weather and direct sunlight. To provide security from predators. To provide a measure of biosecurity by not allowing droppings from wild birds to land. 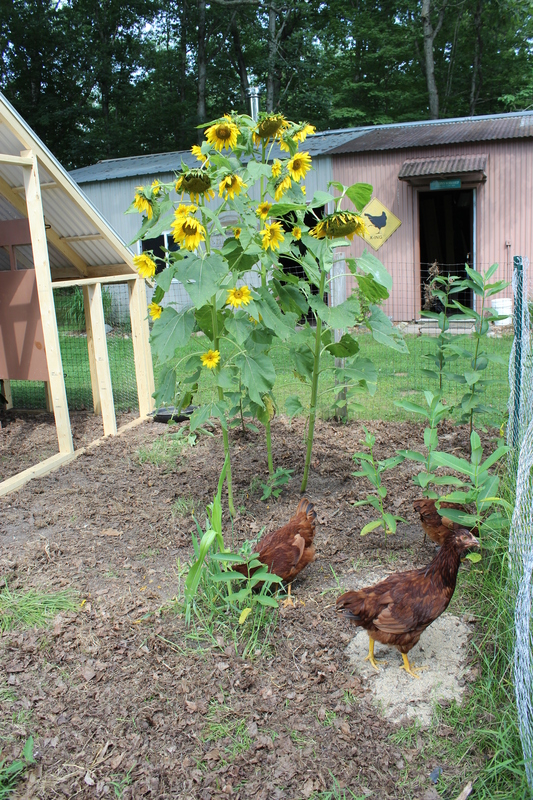 Happy chickens lay happy and tasty eggs! This entry was posted in Uncategorized and tagged Adventure in chickens, Adventures in chicken keeping, Benefits of a closed chicken run, Chicken Adventures, Chicken keeping, Chicken runs, Chickens at the Small House Homestead, Donna Allgaier-Lamberti, Rhode Island Reds, Rural homesteading, Small House Homestead. Bookmark the permalink.